Moist sandy, mucky, or boggy shores of a large number of small lakes in the southwestern Lower Peninsula, especially by receding lakes. 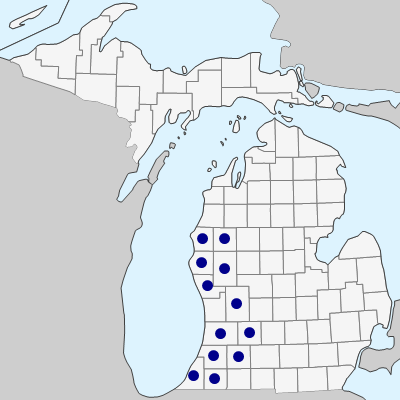 A species of disjunct distribution, not found between Michigan and northern Indiana and the Coastal Plain (and inland Virginia). The culms tend to arch and root at the tip. Plants lacking achenes may thus resemble E. rostellata, from which they may be easily distinguished by the presence of a definite narrow tooth (up to 1 mm long) at the summit of the leaf sheath in E. melanocarpa; in E. rostellata the sheaths are truncate with at most a callous swelling. MICHIGAN FLORA ONLINE. A. A. Reznicek, E. G. Voss, & B. S. Walters. February 2011. University of Michigan. Web. 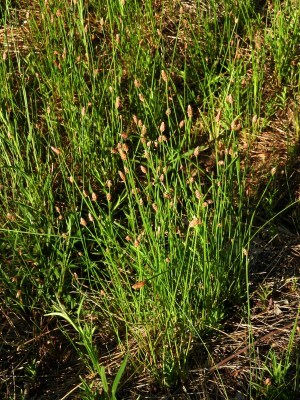 April 21, 2019. https://michiganflora.net/species.aspx?id=1110.